(PUBFree Press)A collection of writings from one of the pre-eminent Jewish thinkers in the 20th century. Not only a brilliant theologian, Heschel was also a consummate wordsmith; his Hasidic outlook is especially strong on religious experience, God, history, and Torah, less developed regarding the state of Israel. 275 pages, softcover. 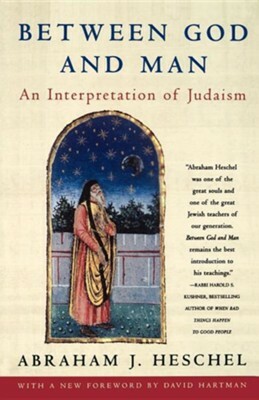 Abraham Heschel's classic work, originally published in 1965, now with a new Introduction by noted Jewish theologian David Hartman, examines questions of faith, divinity, self-sufficiency, and other basic tenets of Judaism, confirming Reinhold Niebuhr's belief that Heschel is "a commanding and authoritative voice not only in the Jewish community but in the religious life of America". I'm the author/artist and I want to review Between God and Man: An Interpretation of Judaism from the Writings of Abraham J. Heschel.